"The Silent Spirit of Dawn"
Waabanong onji-maajitaan babaandawaabiiyan. Mii’iwedi waabanong baa’onjishkaag bimaadiziwin…..Endaso giizhik ishpendamowin biionji-ombakone waabanong. Gaawiinina gidishpendanzii bimooko’ag gimishoomisinaan? Gaawiin ina giibiidamanjitoonsiin nawajgegoo ishpendaagwak. Na’endan gidinaamaagenimoyan gaye agaasenimoyan. Nawaj jina’endaman epiitenimoyan. - A Seven Grandfathers teaching about the East and the virtue of humbleness. Boozhoo, aaniin, hello, biindigen miinawaa, welcome again! Zhaawano-giizhik nindanishinaabewinikaazowin. Waabizheshi niin indoodem. I am Zhaawano Giizhik and I belong to the Ojibwe (Anishinaabe) marten clan. I am an artist who creates jewelry and graphic art, which I use as illustrations to my blog stories. This blog story is the eighteenth already in a series titled Teachings Of The Eagle Feather, featuring my works of art, sporadically along with those of kindred artists. Both my stories and my artworks seek to provide an insight into the unique izhinamowin (world view) of the Anishinaabe Peoples. Today's story is the story of Waaban, the Spirit of the the East and the Dawn. It is a story that wants to breathe acknowledgement of, and gratefulnes for, the blessings that our relatives to the East bring us each morning when we rise. 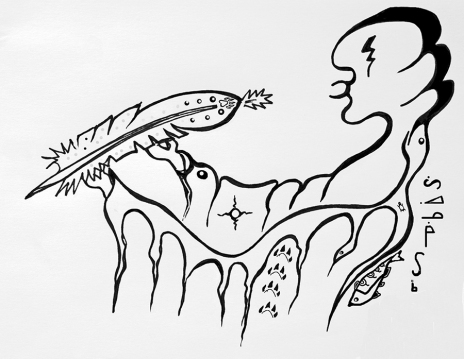 The story is woven around two graphic illustrations, one of which I drew as a young teenager, titled Gigizheb Anamewin (Morning Prayer - see the image to te left), and the other many years later, titled The First Feather. 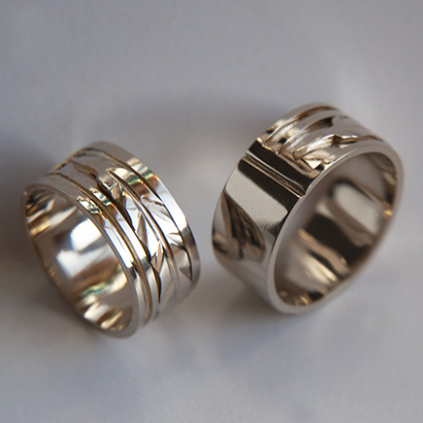 The story also features a set of white gold wedding rings that I created at my workbench a few days ago. The set, which features inlaid eagle feathers, is tittled Oshkiwaaseyaaban. 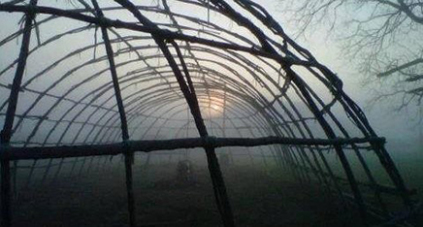 This is an Ojibwe word meaning First Light of Dawn. The title of the set, the sleekly modeled eagle feathers, as well as the white color of the bands symbolically reflect the age-old, sacred worldview of the Anishinaabeg Peoples of Turtle Island. Gete-ayaa’ag, our ancestors, tended to interpret and respect the countless phenomena, forms, and forces of the world they lived in a cosmological context. They saw the world as one gigantic sacred web of social relations, an extended family where the relationship between humans and the nonhuman and spirit world was one of continuous interfusion and reciprocal exchange. All life forms were considered animated and inter-related “persons” - often addressed as gidinawemaaganinaanig (literally,“our relatives”) -, each possessing a consciousness, rationale, and a will of their own. All these indinawemaaganag or “next of kin persons” were often described as gakina gegoo, “everyone and everything” or “all living things” (pronounced gu-ki-nu gay-goo). These relations included the manidoog ajiwekamig (pronounced mah-nih-DOOG-ah-gee-WEH-kah-mik), or the spirits that live in all corners of the Universe; even those that seemed to be more remote to mankind. 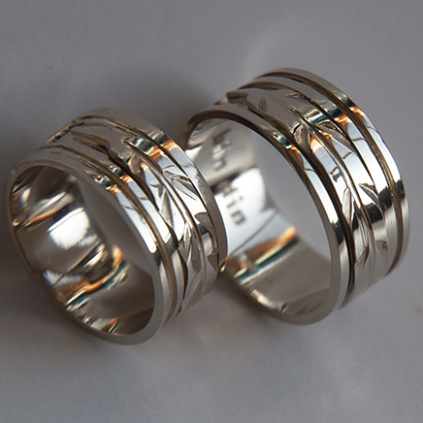 The wedding rings, which I named “First Light of Dawn,” tell a story about the connection that we as humans have with gidinawemaaganinaanig: our relatives the plants, the animals, and manidoog ajiwekamig. Besides telling a story, the ring set represents a silent invocation prayer to these spirits, and, in particular, to aadizookaanag and aya’aabitamegwaabanong, the grandfathers and spirit guardians that reside and dwell to the East. Waaban is the Ojibwe Anishinaabe word for morning, and the east; called wenji-mooka’ang (“coming from the place of sunrise”) by the northeastern Ojibweg. Waaban, or wenji-mooka’ang, is regarded as the patron of youth and knowledge. According to an old aadizookaan (traditional story of a sacred nature), Waaban-anang, the Morning or Dawn Star, who was originally an apprentice of the Evening Star, an elder incorporeal medicine man in the west who embodied wisdom, began a fight with his teacher that neither could win, but which eventually resulted in the everlasting human conflict of youth and Knowledge (East) versus age and wisdom (West). To this day, Waaban is represented on earth by asemaa, the sacred tobacco. The ancestors taught us that it is Waabanong (in the East), the direction of sunrise and springtime, where we begin our journey as human beings coming from the spirit world, as GICHI-MANIDOO (the Great Mystery of Life) breathes its breath of life into us and our beings transform from an incorporeal to a physical nature. It is to the East that we turn ourselves to look for the lessons of our childhood so that we can recover the internal state of the child and see the world through his innocent eyes again. Since I believe early morning prayer in a quiet place to be one of the highest forms of prayer, it is through these rings that a silent, wordless invocation to the Spirit of Waaban is said. Just as our ancestors, when each new day dawn began with the first sight of the morning star in the east and continued until the sun broke the horizon, used to offer asemaa (tobacco) and anamewinan (prayers) to Gichi-manidoo, the rings - albeit in a mere symbolic sense – equally honor and celebrate the sky grandfathers and life itself, which, as we know, begins at daybreak. So, the morning star and the sun are honored because they illuminate the world and bring us every day light and warmth and new beginnings. In addition to the morning star and the sun, the spirit of MIGIZI, the white headed eagle, is being honored because she/he brings us vision, strength, and courage, and a special prayer is said to MAKWA, the spirit of the Bear, who guards the eastern door of the midewigaan, the ceremonial lodge of the MIDEWIWIN, as he protects the healing ceremonies and sacred rituals that are being performed inside the lodge. Alternately pronounced as muh-DAY-w'win and mi-DAY-win, its literal meaning being “Society (Lodge) of Those Who Are in a Mide State” (Mide meaning something like “Sacred And Unseen”), Midewiwin is a prestigious lodge or association of male and female medicine people/healers and thinkers and artists, respected keepers and protectors of the traditional Anishinaabe way of life and ceremonies that are many thousands of years old. Midewiwin persons are generally called Mide, plural Mideg, participants of the ceremonies are referred to as Midew, plural Midewiig. 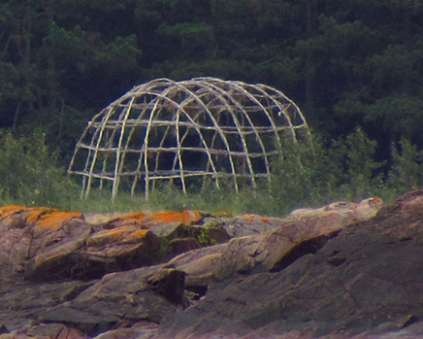 The Ojibwe word for their lodge is Midewigaan (see the inserted image displaying a midewigaan frame). A Midewigaan, a spiritual place, is an elongated structure made of maple saplings tied together in a ceremonial/protocol configuration. Midewiwin – some claim the word partially derives from the Anishinaabe word MINODE’ which means Good Heart, others suggest it derives from MADWEWE which means Sound Resonance, as in the echoing of the Mide water drum whose omnipresent sound represents the Earth’s heartbeat and that of the Great Mystery of Life – is said to have been founded many strings of life ago by the first herbalist/medicine man of his People, who went by the legendary name of Ode’imin (Heart-shaped Berry or strawberry). Under the skilful tutelage of his supernatural teacher Wiinabozho, who taught him to study the nature of plants from the conduct of animals, Ode’imin forever institutionalized the knowledge of curing and mino-bimaadiziwin, or the Code for Long Life and Upright Living. He taught the Anishinaabeg the properties and the curative powers of all beings of the plant world and conferred to them the philosophy of mino-bimaadiziwin, which would forever be propagated through the ceremonies of the Midewiwin. Waabanoowiwin is a distinct Anishinaabe society of visionaries who conduct their healing rituals under the cover of night and conclude them at dawn. Oral traditions trace the origin of the Waabanoo lodge – which is believed to have been established shortly after the creation of Turtle Island - to the original teachings of Wiinabozho. A Waabanoo’s power is obtained in visions received during youth. 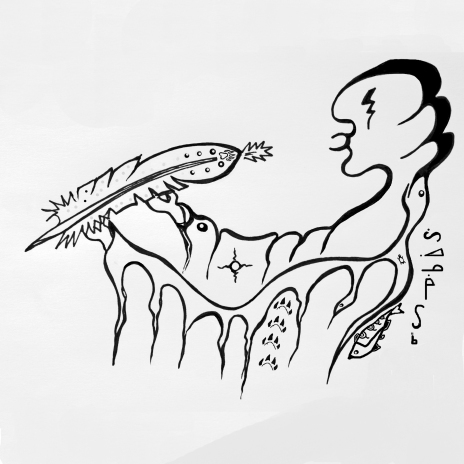 The lodge ceremonies of both Midewiwin and Waabanoowiwin begin with a purification done through a madoodiswan (sweat lodge; see inserted image). However, unlike those of the Midewiwin, the ceremonies of Waabanoowiwin – such as the Fire Dance - have never been “written down,” and always conducted at night and concluded at dawn – hence, the reference to Waaban, dawn. Unlike the Mideg who have four to eight levels, the Waabanoog have sometimes two, and sometimes four; this variation depends on the particular lodge. Another difference is that Waabanoowiwin ceremonies need only one or two Elders, where Midewiwin needs many to lead the ceremonies. Minookamig (the Spring Equinox) is the beginning of the new year to the Waabanoowiwin, where the Midewiwin chose biboon (winter) as the birth time of new life. During the Minookamig Ceremony the Waabanong Manidoo (Spirit of the East) is honored. The Winter Solstice ritual, which is their most important ceremony, is a time of healing for Aki (the Earth) and a time for personal healing. There are differing stories about the origins of the Waabanoowiwin. According to oral traditions, the Lodge originated thousands of years ago, the formation of the society happening shortly after creation; Waabanoowiwin Elders trace the origins of the lodge back to the original teachings of Wiinabozho. For this reason, many aadizookaanan (sacred stories) of Wiinabozho are used in the ceremonies and teachings of the Society. Today, the Waabanoowiwin is said to live a dormant existence, however, initiatives are being undertaken to revive the society. There are active Waabanoowiwin lodges currently in Michigan, Indiana, Saskatchewan, Ontario, and Quebec. 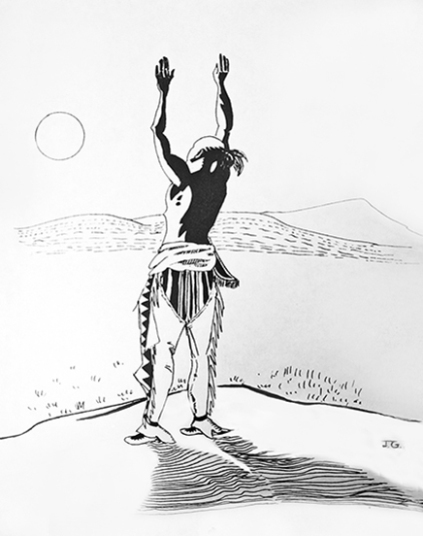 OGIMAA MIGIZI, the Eagle spirit of the Eastern Direction, is considered by the visionaries of the Ojibwe Medicine Lodges as one who looks after the People and ascertains Gichi-manidoo each morning that the women of the nation are honoring the path of life with their asemaa and their nibi waaboo (water song). According to Midewiwin tradition, it was in the long ago when the great Migizi (Eagle manidoo), as she swooped down from the spirit world, left her imprint at the door of the Medicine Lodge where Makwa the bear sat - and where, up until today, the Mide people enter their lodge. Makwa sits between the East and the North. The East is the direction of the rising sun and the North is inhabited by dream-bringing spirits, which makes Makwa the symbol of birth and new life, and the bringer of dreams about new beginnings. Some members of the Midewiwin, who dream of him as offering to give herbs for healing purposes, “follow The Bear Path” in proceeding from a lower to a higher degree in their society. Since there also has to be a west door for the Mide people to leave this life when their time comes, Makwa is not only charged with guarding the eastern entrance that lets in the light but also the exit to the west that leads into the darkness. The following is a fragment of an old invocation prayer* by the WAABANOOWIWIN (The Dawn Society) to the waabanong aadizookaanag, the grandfather spirits that live in the East. The prayer is part of an annual autumn ceremony that celebrates the life and health of the People. Giinawaa aya’aabitameg waabanong, g’maamoyaawimigoom, g’mamajigoom gaye. To you, spirit beings that dwell to the East: we thank you and we honor you. Abi waasheshkaameg n’d’akiiminaan, gakina gego g’abi aabiziishkaamaawaa: w’ga nibaamigag. With your light you revive all that exists from sleep to life. G’d’aabiziishkawaawag niniijaanisinaanig washame ji kishkiyewiziwad wii mino-doodamowad. You revive our children so that they will have increased strength to do good deeds. G’waaseyaashkaanaawaa aki gaa ipshogiishkamigag; g’gii zaagijininiwezhiwim aandi gaa danii’aang aapitanebawinaang. You make light the earth that is wrapped in darkness; you bring mankind back from the sphere of half-death to the upper world where there is light. Azhi waaseshkameg aki, apegish gaye niinawind izhi giikimangit n’d’abinoojiiyag ji maamenowaabandamowad. As you already illuminate the world for us, it is our wish that we enlighten our children so that they can see clearly the path that is ahead of them. Inenimishinaang ji aanikenimangdowaa gikendamowin n’mishoomisinaabaniig, n’ookomisinaabanii ga aanikenimaaki’aangiban, ji nibwaakaawad, ji zhawenjigewad ji zoongide’ewad, ji gishki’aawiziwad gaye. Inenim ji waaseyaabindamowad, ji mino-doodamowad gaye. Enable us to pass to them the teachings of wisdom bequeathed on us by our forefathers and foremothers, so that the young, too, may grow strong and wise, so that they may show compassion, and so that they may be brave. And enable them to have life-guiding visions that will lead them to doing good deeds. Gego inenimishkaangen ji wi-ineniminangid niniijaanisinaanig megwaa debagwendamaang. Nindapenimigonaan ji gayek inaginige’aang, azhi apenimongidowaa. Mii ezhi-bagidinamiwangid. Apegish mino odaapinamaawaad, gaa-ginaawidowaad. Don't consider this matter too long as we think of our child in a hopeful manner. They rely on our valued judgment, just as we rely on them. This is our gift to them. Hopefully, this gift is well-accepted in everything they do. Zhawenimig gaye nindowemaanaan. Dibishkoo ga izhi aabizishimishinaang, aabizishimig. Geyaabi w’da mino-doodam. Also have pity on our relative. As you awakened us from deep sleep, let her be healthy again. She has still much good to render to the world. Inenimishinaang ji mino-doodamaang noongom giizhigag, waabang, minik gaye geyaabi ge abi waabanangwen. Enable us to do good on this day, and tomorrow, and when the morning star rises after the day of tomorrow. * Source: Ojibway Ceremonies by Basil Johnston, p. 183, First Bison Book printing 1990. University of Nebraska Press. This wedding ring set, which I titled “First Light of Dawn,” is constructed of a sleek and modern design of 14K white gold. The design of the rings distuinguishes itself by a minimal design, its sober yet dramatic white-on-white tones creating a story of quiet beauty and wonder. 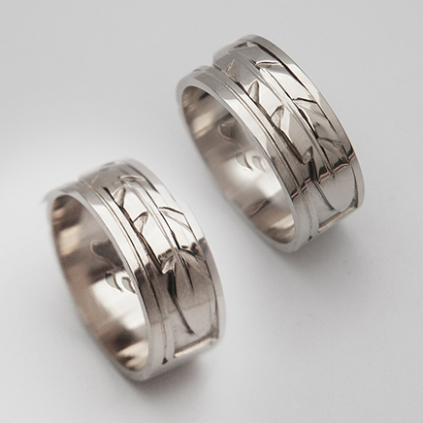 Both rings are inlaid with a straight-lined, sleekly stylized eagle feather symbol. The interiors of the rings display a stylized bear paw design (optional). The eagle feather of white gold represents the spirit and the vision of Migizi, the bald eagle who lives in the East. The straight line that runs parallel with the cut out rectangular recession holding the eagle feather depicts the spiritual journey of Makwa the Bear. As he is the guardian spirit of the Eastern door of Midewigaan (the Midewiwin Lodge), Makwa epitomizes birth and new life and is looked upon as an important bringer of medicine and dreams about new beginnings. 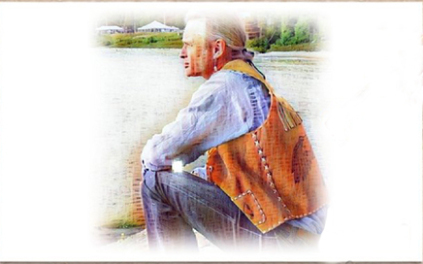 So, in a way, the straight line running parallel to the eagle feather leads to mino-bimaadiziwin: a good, long, and wholesome life for the wearers of the rings – and, in a broader sense, a better life for the People and the generations to follow. The way I see it, the clean and minial design of these eagle-feather-and-bear-paw rings is a contemporary statement of beauty that may be at first sight Western-oriented. Yet at the same time the eagle feather symbol and the bright white color of the rings reflect the spirit of wisdom of giiwedinoong-mitigwaakiing nindaayaanikaaj mishoomisag: my own ancestors from the northwoods. 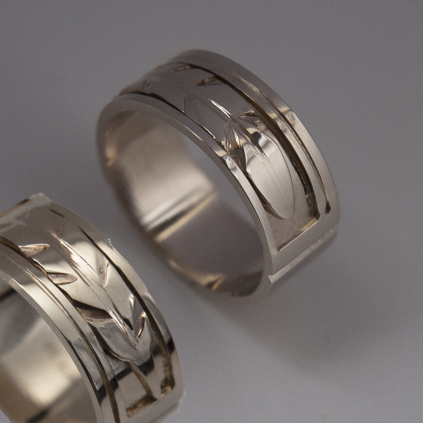 I wanted the rings to be a stylish synthesis between Anishinaabe izhinamowin and contemporary design, and I wanted them to be a heart-felt prayer and to speak eloquently of a time of wisdom and harmony and pure form. The white gold eagle feather featuring both rings refers to Migizi the bald eagle, the spirit keeper of the east who carries our thoughts and prayers to Gichi-manidoo and teaches us the virtues of courage, vision, and clarity of the mind. The straigth line running parallel to the feathers symbolizes the Bear Path that goes from east to west, thus epitomizing birth and new life. The (optional) bear paw designs inside the rings denote the central role of makwa, the bear, in the ceremonies, rites, and belief system of the Anishinaabe Medicine Lodges. 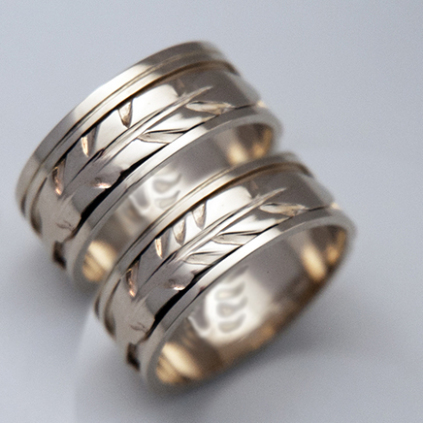 Thus the notions of ceremony, birth, rebirth, and illumination symbolically merge together in these unique wedding rings. It is my hope that the design and the story of the rings guide the owners of the rings to the lessons that they both seek while together walking the Path of Life and, eventuallly, bring them both closer to the teachings of the ancestors – and, ultimately, through ceremony and reflection, to Gichi-manidoo, the Great Mystery, the Father Creator Spirit, the One-Who-Created-All. Giiwenh. That's how far the story goes. Thank you for reading and listening. Miigwechiwendan akina gegoo ahaw! Be thankful for everything! Zhaawano Giizhik, an American currently residing in Amsterdam in the Netherlands, was born in 1959 in North Carolina, USA. Zhaawano has Anishinaabe blood running through his veins; the doodem of his ancestors from Baawitigong (Sault Ste. Marie, Upper Michigan) is Waabizheshi, Marten. As a second- generation Woodland artist who writes stories and creates graphic art and jewelry designs, Zhaawano draws on the oral and pictorial traditions of his ancestors. For this he calls on his manidoo-minjimandamowin, or "Spirit Memory"; which means he tries to remember the knowledge and the lessons of his ancestors. In doing so he sometimes works together with kindred artists. To Zhaawano's ancestors the MAZINAAJIMOWINAN or "pictorial spirit writings" - which are rich with symbolism and have been painted throughout history on rocks and etched on other sacred items such as copper and slate, birch bark and animal hide - were a form of spiritual as well as educational communication that gave structure and meaning to the cosmos that they felt they were an integral part of. Many of these sacred pictographs or petroforms – some of which are many, many generations old - hide in sacred locations where the manidoog (spirits) reside, particularly in those mystic places near the lake's coastlines where the sky, the earth, the water, the underground and the underwater meet. The way Zhaawano understands it, it is in these sacred places invisible to the ordinary, waking eye that his design and storyteller's inspiration originate from. Click here to receive an email when my blog is updated.